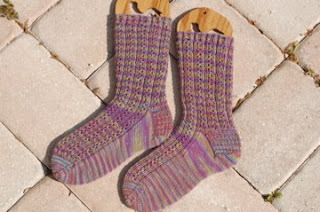 I finished my pair for the month--Evelyn Clark's Go With the Flow Socks from Favorite Socks by Interweave Press. I used Addi Turbo US Size 1 and Lorna's Laces Shepherd Sock in the Watercolor colorway. It striped nicely but the yarn was not distracting to the pattern. Loved the stitch definition of the sock and the pattern was easy to memorize. They are also nice and stretchy so could be a good gift giving pattern.